Trivia: Second part of Fernando Di Leo's "Milieu Trilogy"
In New York, a crime boss is giving instructions to two hit men; Dave (Henry Silva) and Frank (Woody Strode), who've been hired to travel to Italy and execute a small-time pimp. “I want you to kill him in the most brutal way possible”, the boss says, “because I want it to be conspicuous, sensational”. The stage is thus set for Fernando Di Leo's The Italian Connection, a film that, right at the outset, promises plenty of action. This situation arose when a valuable shipment of heroin never arrived at its final destination. The Italian mob sent word to New York that the shipment was stolen by former gangster and current pimp, Luca Canali (Mario Adorf), the man Dave and Frank are now on their way to kill. Not thrilled by the prospect of Americans knocking off a fellow countryman on their home turf, the Italians, led by Don Vito Tressoldi (Adolfo Celi), decide to take out Canali themselves. Naturally, Canali is innocent, and not being a particularly savvy criminal, has little choice but to hit the road and search for a place to hide. But with gangsters from two countries hot on his trail, the odds are stacked against him. Once in Italy, the two hit men don't even try to hide the fact they're Americans. Silva's Dave is arrogant, making a pass at the woman hired to be their guide (Luciano Paluzzi) and demanding she take them to a night club, where they might find some female companionship to keep them warm as they search for Canali. Strode's Frank, on the other hand, is the strong, silent type, interested in finishing the job and nothing else. It's a strange pairing, and the two characters don't always see eye-to-eye. As for their performances, neither actor is particularly strong (Strode is especially uneasy with the dialogue), but then their parts demanded charisma above anything else, and on that level they don't disappoint. In contrast, Mario Adorf is both charismatic and convincing as Luca Canali, the pimp framed for a crime he knows nothing about. When we first meet Canali, he's breaking up an argument in a park, which he does by knocking both combatants to the ground. One of the men comes back at him with a knife, and Canali again gets the better of him, slapping him silly as he lays on the ground. Canali's violent slaps slowly soften to gentle pats, however, when the police show up, as if he was simply trying to revive the guy following a fainting spell. As played by Adorf, Luca Canali comes across as a bit of a sad sack, a guy whose life expectancy is numbered by hours instead of days. Despite his opening scene, Canali is not known for his ruthlessness (he was kicked out of the mob because he couldn't hack the violence), and for that matter, isn't even considered a very good pimp. A small-timer, he's caught completely off-guard by the fact two Americans have been asking about him, and is understandably nervous when Don Tressoldi sends a couple of henchmen to collect him. But to the mob's surprise (and ours), Canali has a few tricks up his sleeve, and luck is definitely on his side. He gets the better of Tressaldi's goons and slips away, something he's able to accomplish on a number of occasions. Suddenly, a guy who looked like an easy target is anything but, and what seemed like a routine story of mob revenge has become much more interesting. 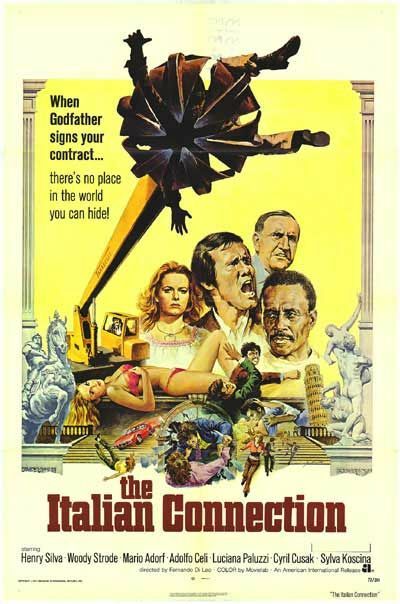 With plenty of action and a few surprises as well, The Italian Connection is a fun movie, and damned exciting to boot.